Continuing our examination of the idea that certain stories have conceptual premises. What is a conceptual premise? And how does it work in a dramatic narrative? The universe makes sense. Life has meaning. We humans are not lost and alone in a random, indifferent cosmos. David Mamet says over and over in his books on writing that the human heart is programmed to perceive drama, i.e. meaning, in everything. That’s why we need stories. Because stories reinforce the idea of meaning. Drama starts at A and progresses to Z. Along the way, we learn. Truths are revealed. Secrets are disclosed. We walk out of the theater reassured. Life may be hard and brutal and justice may not always be served, but there is meaning and significance underneath it all. That’s a what-if, but it’s not a conceptual premise. That’s a premise. You might not believe it. You might say, leaving the theater, “Oh come on, no one’s gonna lose their mind to that extent. To punch themselves in the face, over and over, and think they’re being hit by somebody else?” You might not believe it driving home, but in the theater it was pretty powerful, wasn’t it? As writers, if we can identify our premise, we can harness it to work inside the story and to amplify powerfully the narrative’s impact. My own belief is that every story has a premise. We as writers might not be aware of our own premises, even though every word we write is based upon them the same way every girder in a bridge is supported by its conceptual and foundational structures. Are you working on a novel about Queen Boudica of early Britain? Have you got a cop story going? Or a Thomas Pynchon-esque megabook about the origins of the cosmos as reflected and refracted in a single teardrop? There’s a premise in what you’re working on. Find it. Ask yourself what precept, what principle is the architecture and superstructure of your story based on? What’s the foundational truth (even if that truth isn’t literally “true?”) That premise is the lever and fulcrum with which you can move the world. More on the writing of The Legend of Bagger Vance next week. I like what you said about a foundational truth in your story not having to be “true.” That’s the purpose of the story, to examine the “what if?” as a scientist would experiment with a hypothesis. Some awesome stuff can come of this, I need to hone in on incorporating conceptual premises when I write. 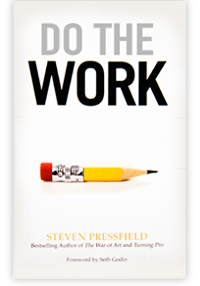 Mr. Pressfield, this advice is incredibly helpful. It seems so simple and obvious now, with the light shone on it. I’d like to add my voice to the many who have paid gratitude for your work. I mean it. After reading (and re-reading) The War of Art a few years ago, I gave up booze completely and I get up at 4:30 each morning to “work before work”. 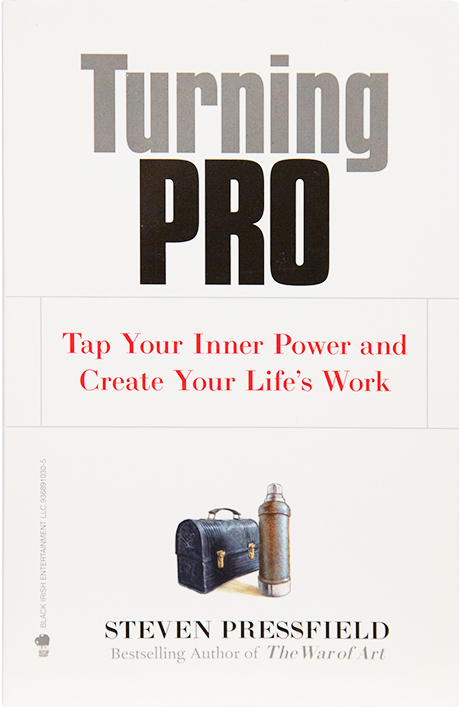 When people say things like, “that book changed my life”, it’s generally an overstatement. This time it’s not. Your work touched off perhaps the most pivotal moment thus far in my life (and I’m not young). Think about that. Thanks, Eric. Giving up booze and getting up at 4:30 each morning? U R the Man! Just finished Gates of Fire. What a great book and thank you! Always “knew” the story… but never lived the story! Thanks! So what, then, is the premise for Mr. & Mrs. Smith? I’ve not seen it, but going by your description would it be simply that there are professional assassins among us, blending in and hiding their vocation from even their spouses? I would love to be able to compare “what if” which is easier to find with “premise” in the particular case. Steve, sorry, I don’t understand this post. What is the premise of the Fight Club? What is the underlying order? Why doesn’t Mr. and Mrs. Smith have a premise, i.e., it’s possible for two people to be married to each other and have no idea of who each other are. Does a premise have to have underlying meaning? 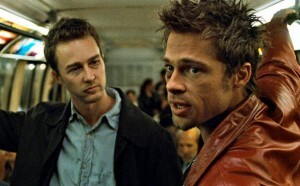 Does The Fight Club have underlying meaning? I think Fight Club’s underlying message was supposed to be that capitalism is bad, mmmmkay, so we should just listen to Brad Pitt when he says we should give up all our possessions, ditch our jobs, and go live in hovels with our imaginary friends. Except when it’s time to see his movies or buy the new issue of People with the cover story about Brad and Angelina’s vacation in Zaire. Hah, that sounds pretty harsh, but I actually enjoyed the book and the movie. Man, I keep reading these Writing Wednesdays columns and wondering if I’m shooting myself in the foot by not having an overt theme or a clear cut antagonist in my book. It’s driven by a central mystery, and the characters set out to solve that mystery. An answer (or at least a partial answer) comes before the midpoint of the book, and spawns a thousand new questions. As a reader, I love the allure of the unknown and the feeling that absolutely anything is possible. I’m also mindful that the best way to write a mystery-driven story is to ever-so-carefully reveal bits and pieces. And I’ve always found random, meaningless, cosmic tragedy more terrifying than most emotionally-motivated wrongs. If a guy walks into his former office and shoots the supervisor who fired him, of course we won’t agree with the action, but we can recognize the emotions that spurred it. Whereas if your wife or child or another loved one is with you on the beach one sunny day and gets swallowed by a freak wave, there’s no meaning at all. It’s cruel and horrible and life-changing, but there’s no malice behind it, nothing to understand. And somehow that makes it even more awful and more cruel, that a life was snuffed out for no reason at all. Once again I’ve written too much! Premise-theme-character-plot: A story, perhaps even a life, must have all of these. (Let’s incude setting under plot.) Above, you present the premise as a question and the theme as a statement (declaration). Elsewhere, you, and others, talk about conflict in character and conflict in plot. I suspect that some intersecting lines can be drawn here, since the charactr’s conflict while at least parallel is not always the same as the plot’s conflict. (you pointed this out, I think.) Perhaps it’s not so much the answers to the questions as it is the search for meaning the questions imply. 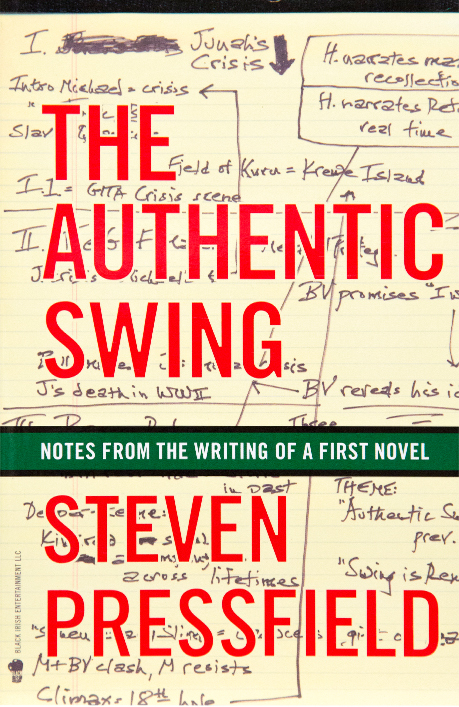 Steve – It seems to me that the “Authentic Swing” can be found in every career, in every job, but to find it, we need to define what we’re trying to accomplish. 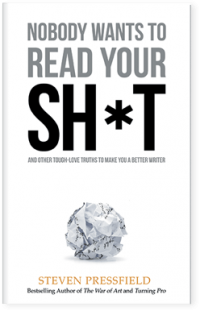 Writers have it easy; our success or failure is apparent paragraph by ugly paragraph; as opposed to golfers searching for their “Authentic Swing,” as writers, we seek to pick the best word and the best phrase that support our best premise. What I find, when sitting at my desk, is that the “Authentic Word” is often hard to find. For whatever reason, I lose my rhythm, I tighten up and get constricted (P. 162 of my leather-bound copy of Legend of…! ), and with no Bagger Vance sitting at my side, what to do? I pull a book off my shelf and use it for inspiration…’How Green Was my Valley,’ ‘Strong Men Armed’,’ Gates’…there are a few books on which I can rely for inspiration. Is this stealing, as you discussed a few weeks ago? I’d say no, because that wouldn’t be true to my ‘Authentic Swing / Word.’ But reading a few pages expands my thoughts, brightens my aura, and the words begin to flow again. Oh, they’ll be edited, re-edited, and edited again, but I know I’m on the right track. Great points on inspiration, Andrew!